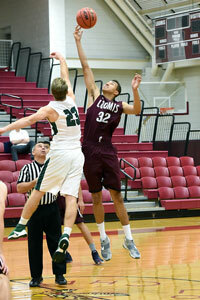 The Loomis boys basketball program is a perennial power in New England prep school basketball. Laying an impressive foundation for the Pelicans, legendary coach Ralph Erickson set the standard in 1946, on which the current coaching has continued build. Loomis has been one of the most dominant and consistent Class A programs during the past decade. Compiling an impressive record that includes New England Tournament Final Four appearances, a New England Tournament championship, and numerous league and conference titles, Loomis plays a competitive 22-game Class A schedule and hosts a three-day, eight-team tournament each December. Loomis plays in the finest basketball facility in New England, a state-of-the-art arena with stadium-style seating. At Loomis we take tremendous pride in the tradition of excellence that underscores our message of one unit, one common goal. We look forward to welcoming you into our program. The boys basketball team ended its season with a 44-62 loss to top-ranked Phillips Exeter Academy in the Class A New England Prep School Athletics Conference Championship. On Tuesday, January 29, the boys JV and varsity basketball programs hosted players from the NBA Academies Select Team, a collection of U17 prospects representing NBA Academies in Africa, China, and India. The boys varsity basketball team defeated Deerfield Academy 79-45 on the road on Wednesday, January 23, giving the Pelicans their second win against the Doors this season.